Japanese Prime Minister Shinzo Abe is considering a Latin America tour this summer between late July and early August, according to government sources quoted by Kyodo News. The tour will include visits to Brazil, Chile, Mexico, Trinidad and Tobago, and possibly either Peru or Colombia. The government source stated that the trip is intended to garner support for Japan’s bid to secure a nonpermanent seat on the U.N. Security Council next year. The timing of the tour is advantageous for Abe as it will occur between Diet sessions, during which he is seeking to change Japan’s pacifist interpretation of Article 9 of the Constitution to include the right of collective self-defense. Even if Abe is unsuccessful in getting his Cabinet to agree to the new interpretation before the end of the Diet session in June, there will still theoretically be time before the Diet session in the fall. Securing Cabinet approval would be a boon to Abe before his tour, but the possibility of it still being on the table before the year’s end will underline Japan’s bid for the Security Council, as it seeks to define its own security identity. Aside from security related matters, Abe will be visiting two or three potential members of a future Trans-Pacific Partnership (TPP) in Chile (which is a member of the TPP precursor Trans-Pacific Strategic Economic Partnership Agreement) Mexico and possibly Peru during his trip. He will likely raise the TPP with these relevant partners, yet events at home will dictate how strongly he can push for Japanese integration into the trade pact. By the time Abe leaves on his Latin America tour, the latest structural reform portion of Abenomics will have been underway for well over a month. If those reforms prove to be substantial enough to entice new foreign investment and reinvigorate domestics business (along with their large sums of idle capital), then Abe may have the political capital necessary to push for further TPP integration while abroad. A poll conducted by the Mainichi Shimbun on Monday showed that 52 percent of Japanese think the country should not make any compromise with other parties in the current TPP negotiations. Abe’s reforms will have to show strong improvements in the economy before the Japanese people change their minds, and perhaps not even then. The Kyodo News article above also mentions that Abe will be in Brazil soon after Chinese President Xi Jinping will have visited (at the invitation of Brazilian President Dilma Rousseff) to watch the final World Cup match. Just last week Japan’s trade ministry accused China and Brazil of unfair trade practices with regard to steel tariffs and auto taxes, respectively. While these are two key industries for Japan, Abe will not want to lose further ground to China in a country like Brazil which is so hungry for infrastructure investment. 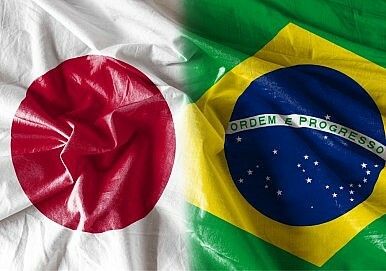 There is a sizeable Japanese population in Brazil, and Japan was Brazil’s fifth biggest import and seventh biggest export partner in 2012. Several other countries will also be important stopovers for Abe. Japanese companies invested almost $10 billion in Mexico from 2005 to the beginning of 2013. Mexico-Japan bilateral trade was more than $20 billion in 2011, with Japan enjoying a very favorable trade balance. Japan also just concluded the fifth round of negotiations for an Economic Partnership Agreement with Columbia last week. Abe will be intent on solidifying these trade and investment partnerships in the hopes of finding more partners to sustain Japan’s economic recovery. In all likelihood, a Japanese seat on the Security Council will be the biggest item on Abe’s agenda as he travels through these countries. Latin America is not overly tied to China, which may seek to block Japan’s bid. Abe will try to give his visit maximum visibility, without risking political missteps over issues as sensitive as the TPP. His goal will be to generate as much goodwill as he can, and “promote cooperation in a range of areas such as the economy and energy, “ according to the government source. Abe can use Japan’s large economic weight and investment potential as a carrot, but he will have to do so skillfully. China can outmatch Japan now in sheer trade and investment numbers in most regions around the world. Abe will probably seek to make public relations and cultural exchange a significant element of his agenda in the hope of striking the right balance while currying favor.